New ways of making forward operating bases used by British troops in Afghanistan easier to construct and more energy efficient were displayed yesterday. 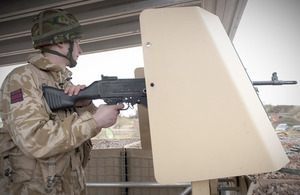 The MOD’s Programmes and Technology Group has been collaborating with industry to develop an open architecture and create a scalable, modular approach to tactical base equipment and infrastructure. Building a forward operating base [FOB] can take anywhere between a fortnight and up to five or six weeks. When you are building it, you have to do so as quickly as possible. It can be quite a demanding operation because you have to make do with what you have - and sometimes certain components will not be compatible with one another. A FOB is essentially a home to armed forces personnel so you want to make sure it is as comfortable and accommodating as possible. The idea of FOBEX is looking at ways we can be more efficient. Having lighter and more portable kit, which is quicker to assemble and creates more of a standard base, will not only use less energy but save lives. Today is part of a wider aim to have more joined-up thinking - as well as forging relationships with larger and smaller companies. Some ideas, such as hybrid generators, could be extremely beneficial and even applied to boats. There is also a company which has developed inflatable solar panels as well as repairable ones. The latter are incredibly useful because each solar panel can cost around £700 to replace.